The last thing Jazz wants to do is compare make-up tips with ditzy dames competing in the Miss Universe contest, known as the "International Pageant of Pulchritude and Bathing Girl Revue." She'd rather help solve the murders of young prostitutes who turn up all over town, but city officials insist on burying the stories during Splash Day festivities. After Jazz gets to know the bathing beauties, she realizes there's a lot more to them than just pretty faces and figures. Jazz becomes suspicious when she finds out the contest is also sponsored by the Maceos, aspiring Beach Gang leaders and co-owners of the Hollywood Dinner Club, where the girls will perform before the parade and pageant. Worse, her half-brother Sammy Cook, owner of the Oasis, a speakeasy on a rival gang's turf, asks her to call in a favor from handsome Prohibition Agent James Burton: He wants Agent Burton to raid the Hollywood Club during the bathing beauties dance routine--or risk revenge from the Downtown Gang leader. Her loyalties torn, Jazz is faced with an impossible task that could compromise both of their jobs and budding romance. You can check out my review of the first book in this series, Flappers, Flasks and Foul Play HERE. 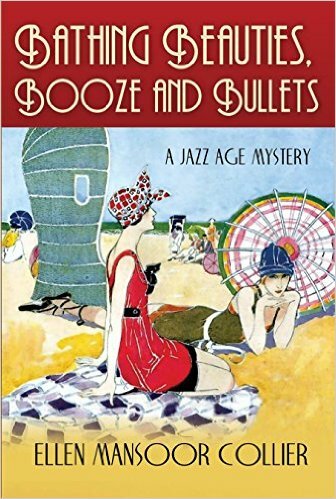 I discovered this Jazz Age Mystery series while researching 1920s fiction and I tested the waters with Flappers, Flasks and Foul Play, which I adored. But, I gotta be honest. I enjoyed Bathing Beauties, Booze and Bullets EVEN MORE than the first book in this series! The plot, the slang, the characters, the details- they swirled together with all the cinematic verve of a Billy Wilder film! Twists and turns in the story definitely had me guessing (and getting it wrong, lol) more than in the first book. Jasmine Cross (aka Jazz), the ballsy belle the Jazz Age Mysteries revolve around, continues to be fleshed-out in BBBB and I fell in love with her character a little more. I loved being inside Jazz’s head while she schemed all over town and connected overlooked dots to solve this Galveston murder mystery based on true events. Jazz is ready to move up from Society reporting and into the big time: Crime reporting. She proves to her fellow male colleagues at the Galveston Gazette that she’s got the moxie it takes to investigate big cases and I felt like Ms. Cross definitely left an impression on her boss. Maybe Jazz will be moving on up in the next novel? I’ll have to wait and see. There was a flicker of a romance in Flappers, Flasks and Foul Play that fans into a slightly bigger flame in Bathing Beauties. I really enjoyed the dynamic between Jazz and her love interest and can’t wait to see where it goes in the next novel. The author does a really great job at capturing the cultural climate of Prohibition era Galveston. Everything from the customs, mannerisms, dialogue and gender roles/expectations bring this historical mystery to vivid life. Ellen Mansoor Collier has a knack for describing all the decadence of the era from saloons, to brothels, to dresses, to perfumed lamps. It’s like walking into a magical transporting antique store when reading the author’s descriptions of stuff from the 20s. It made me want to run to the nearest flea market or antique mall to find the cool collectibles she references. In short, these books have basically made me want to ditch my modern life and become a full-time flapper journalist. Ha! Check out the author’s lovely website HERE and her ETSY shop HERE, where you can browse all sorts of vintage items and fabulous flapper finds!